St Theodosius was born at Mogariassus, called in latter ages Marissa, in Cappadocia, in 423. He imbibed the first tincture of virtue from the fervent example and pious instructions of his virtuous parents. He was ordained reader, but some time after being moved by Abraham's example to quit his country and friends, he resolved to put this motion in execution. He accordingly set out for Jerusalem, but went purposely out of his road to visit the famous St. Simeon Stylites on his pillar, who foretold him several circumstances of his life, and gave him proper instructions for his behaviour in each. Having satisfied his devotion in visiting the holy places in Jerusalem, he began to consider in what manner he should dedicate himself to God in a religious state. The dangers of living without a guide made him prefer a monastery to a hermitage; and he therefore put himself under the directions of a holy man named Longinus, to whom his virtue soon endeared him in a very particular manner. A pious lady having built a church under the invocation of the Blessed Virgin, on the high road to Bethlehem, Longinus could not well refuse her request that his pupil should undertake the charge of it; but Theodosius, who loved only to obey, could not be induced by any entreaties to consent to this proposal: absolute commands were necessary to force him to a compliance. Nor did he govern long; for dreading the poison of vanity from the esteem of men, he retired into a cave at the top of a neighbouring desert mountain, and employed his time in fasting, watching, prayers, and tears, which almost continually flowed from his eyes. His food was coarse pulse and wild herbs: for thirty years he never tasted so much as a morsel of bread. Many desired to serve God under his direction: he at first determined only to admit six or seven, but was soon obliged to receive a greater number, and at length came to a resolution, which charity extorted from him, never to reject any that presented themselves with dispositions that seemed sincere. The first lesson which he taught his monks was that the continual remembrance of death is the foundation of religious perfection; to imprint this more deeply in their minds, he caused a great grave or pit to be dug, which might serve for the common burial-place of the whole community, that by the presence of this memorial of death, and by continually meditating on that object, they might more perfectly learn to die daily. The burial-place being made, the abbot one day, when he had led his monks to it, said, The grave is made, who will first perform the dedication?" 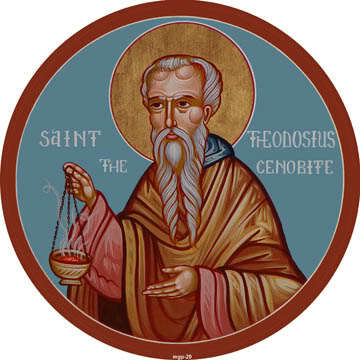 Basil, a priest, who was one of the number, falling on his knees, said to St. Theodosius, "I am the person, be pleased to give me your blessing." The abbot ordered the prayers of the church for the dead to be offered up for him, and on the fortieth day Basil wonderfully departed to our Lord in peace without any apparent sickness. When the holy company of disciples were twelve in number it happened that at the great feast at Easter they had nothing to eat; they had not even bread for the sacrifice: some murmured; the saint bid them trust in God and he would provide; which was soon remarkably verified by the arrival of certain mules loaded with provisions. The lustre of the sanctity and miracles of St. Theodosius drawing great numbers to him who desired to serve God under his direction, his cave was too little for their reception, therefore, having consulted heaven by prayer, he, by its particular direction, built a spacious monastery at a place called Cathismus, not far from Bethlehem, at a small distance from his cave, and it was soon filled with holy monks. To this monastery were annexed three infirmaries: one for the sick, the gift of a pious lady in that neighbourhood; the two others St. Theodosius built himself, one for the aged and feeble, the other for such as had been punished with the loss of their senses, or by falling under the power of the devil, for rashly engaging in a religious state through pride, and without a due dependence on the grace of God to carry them through it. All succours, spiritual and temporal, were afforded in these infirmaries, with admirable order, care, and affection. He erected also several buildings for the reception of strangers, in which he exercised an unbounded hospitality, entertaining all that came, for whose use there were one day above a hundred tables served with provisions: these, when insufficient for the number of guests, were more than once miraculously multiplied by his prayers. The monastery itself was like a city of saints in the midst of a desert, and in it reigned regularity, silence, charity, and peace. There were four churches belonging to it, one for each of the three several nations of which his community was chiefly composed, each speaking a different language; the fourth was for the use of such as were in a state of penance, which those that recovered from their lunatic or possessed condition before-mentioned, were put into, and detained till they had expiated their fault. The nations into which his community was divided were the Greeks, which was by far the most numerous, and consisted of all those that came from any provinces of the empire; the Armenians, with whom were joined the Arabians and Persians; and, thirdly, the Bessi, who comprehended all the northern nations below Thrace, or all who used the Runic or Sclavonian tongue. Each nation sung the first part of the mass to the end of the gospel in their own church, but after the gospel all met in the church of the Greeks, where they celebrated the essential part of the sacrifice in Greek, and communicated all together. The monks passed a considerable part of the day and night at their devotions in the church, and at the times not set apart for public prayer and necessary rest every one was obliged to apply himself to some trade or manual labour, not incompatible with recollection that the house might be supplied with conveniences. Sallust, Bishop of Jerusalem, appointed St. Sabas superior general of the hermits and our saint of the Cenobites, or religious men living in community throughout all Palestine, whence he was styled the Cenobiarch. These two great servants of God lived in strict friendship, and had frequent spiritual conferences together; they were also united in their zeal and sufferings for the church. The Emperor Anastasius patronised the Eutychian heresy, and used all possible means to engage our saint in his party. In 513 he deposed Elias, Patriarch of Jerusalem, as he had banished Flavian II, Patriarch of Antioch, and intruded Severus, an impious heretic, into that see, commending the Syrians to obey and hold communion with him. SS. Theodosius and Sabas maintained boldly the right of Elias, and of John his successor; whereupon the imperial officers thought it most advisable to connive at their proceedings, considering the great authority they had acquired by their sanctity. Soon after, the emperor sent Theodosius a considerable sum of money, for charitable uses in appearance, but in reality to engage him in his interest. The saint accepted of it, and distributed it all among the poor. Anastasius, now persuading himself that he was as good as gained over to his cause, sent him a heretical profession of faith, in which the divine and human natures in Christ were confounded into one, and desired him to sign it. The saint wrote him an answer full of apostolic spirit; in which, besides solidly confuting the Eutychian error, he added that he was ready to lay down his life for the faith of the church. The emperor admired his courage and the strength of his reasoning, and, returning him a respectful answer, highly commended his generous zeal, made some apology for his own inconsiderateness, and protested that he only desired the peace of the church. But it was not long ere he relapsed into his former impiety, and renewed his bloody edicts against the orthodox, dispatching troops everywhere to have them put in execution. On the first intelligence of this, Theodosius went over all the deserts and country of Palestine, exhorting every one to be firm in the faith of the four general councils. At Jerusalem, having assembled the people together, he from the pulpit cried out with a loud voice: "If any one receives not the four general councils as the four gospels, let him be anathema." So bold an action in a man of his years inspired with courage those whom the edicts had terrified. His discourses had a wonderful effect on the people, and God gave a sanction to his zeal by miracles: one of these was, that on his going out of the church at Jerusalem, a woman was healed of a cancer on the spot by only touching his garments. The emperor sent an order for his banishment, which was executed; but, dying soon after, Theodosius was recalled by his catholic successor, Justin, who, from a common soldier, had gradually ascended the imperial throne. Our saint survived his return eleven years, never admitting the least relaxation in his former austerities. Such was his humility that, seeing two monks at variance with each other, he threw himself at their feet, and would not rise till they were perfectly reconciled; and once having excommunicated one of his subjects for a crime, who contumaciously pretended to excommunicate him in his turn, the saint behaved as if he had been really excommunicated, to gain the sinner's soul by this unprecedented example of submission, which had the desired effect. During the last year of his life he was afflicted with a painful distemper, in which he gave proof of a heroic patience, and an entire submission to the will of God. Perceiving the hour of his dissolution at hand, he gave his last exhortations to his disciples, and foretold many things, which accordingly came to pass after his death; this happened in the one hundred and fifth year of his age, and of our Lord 529. Peter, Patriarch of Jerusalem, and the whole country, assisted with the deepest sentiments of respect at the solemnity of his interment, which was honoured by miracles. He was buried in his first cell called the Cave of the Magi, because the wise men who came to adore Christ soon after his birth were said to have lodged in it. A certain count being on his march against the Persians, begged the hair shirt which the saint used to wear next his skin, and believed that he owed the victory which he obtained over them to the saint's protection through the pledge of that relic. Both the Romans and Greek calendars mention his festival on the 11th of January. It is the opinion of St. Gregory the Great that the world is to some persons so full of ambushes and snares, or dangerous occasions of sin, that they cannot be saved but by choosing a safe retreat. Yet there are some who find the greatest dangers in solitude itself; so that it is necessary for every one to sound his own heart, take a survey of his own forces and abilities, and consult God, that he may best be able to learn the designs of his providence with regard to his soul; in doing which, a great purity of intention is the first requisite. Ease and enjoyment must not be the end of Christian retirement, but penance, labour, and assiduous contemplation; without great fervour and constancy in which, close solitude is the road to perdition. If greater safety, or an unfitness for a public station, or a life of much business (in which several are only public nuisances), may be just motives to some for embracing a life of retirement, the means of more easily attaining to perfect virtue may be such to many. Nor do true contemplatives bury their talents, or cease either to be members of the republic of mankind, or to throw in their mite towards its welfare. From the prayers and thanksgivings which they daily offer to God for the peace of the world, the preservation of the church, the conversion of sinners, and the salvation of all men, doubtless more valuable benefits often accrue to mankind than from the alms of the rich or the labours of the learned. Nor is it to be imagined how far and how powerfully their spirit, and the example of their innocence and perfect virtue, often spread their influence; and how serviceable persons who lead a holy and sequestered life may be to the good of the world; nor how great glory redounds to God by the perfect purity of heart and charity to which many souls are thus raised.